Have a look at our assortment of triangle cut solitaire diamond pendants for that special person with an individual sense of style. 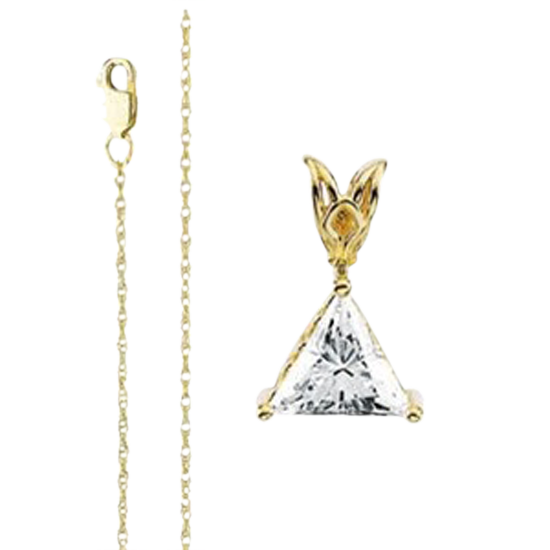 CaratDirect2U carries a selection of half carat to one carat triangle cut diamond solitaire pendants. These diamond necklaces are an excellent gift for someone with a unique sense of style. The rope style chain for our triangle cut pendants are available in lengths of 16, 18, and 20 inches. Our triangle shape diamond pendants are set in a three-prong setting in 14k yellow gold. A few of our triangle pendants have a WGI certification. We also have laser drilled triangle cut diamond solitaire pendants available for sale.